Take a trip among the stars right here at Thorslots! How many times can you say that you’ve launched yourself into space in order to come back with more money in your bank account? Allow us to answer that for you: not enough. Well in the NetEnt developed slot, Starburst, you are given a chance to explore some of the deepest reaches of space. 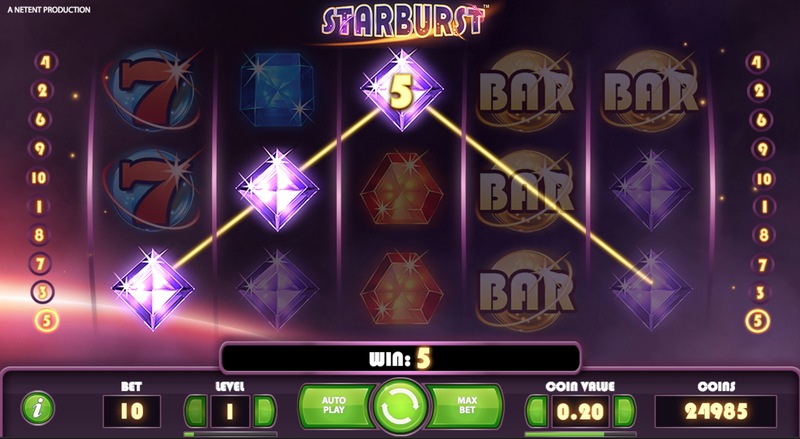 Starburst is a 3D slot that is at the forefront of modern gaming, sitting pretty as one of the most popular online slots out there to date. One could theorise why this slot is so popular — trust us there’s a lot of reasons why — although the most prominent reason is the fact that it is very accessible for players of a variety of different online games entry levels. Starburst is a 5 reel by 10 pay-line slot that grants players quite a lot of opportunities to win big. Although this slot exists within space, a lot of what you see on these reels are considered luxuries on earth, this includes various jewel symbols that can be found cascading across the reels at a very brisk pace. It is of note that there are no additional free spins here, making it a very simple slot to behold, which shouldn’t take away from your drive to play. Wish to know more about Starburst? The rest of our review below should provide enough information moving forwards. The first thing that people will notice when they play Starburst is the accessibility of this slot as we’ve already mentioned. Starburst is a very welcoming slot due to the very bright and bold colours that permeate across the screen; a kaleidoscope of different colours if you will. Starburst could be seen as an evolution of the vintage slots of old, where simplicity was key in attracting players of all backgrounds and entry levels. At first glance you might think that Starburst is more style than substance, granted you’d be wrong in thinking that but then again you might not have played this slot before so it can be easy to assume. Try to go into Starburst with an open-mind and the rest will be sure to follow. As we’ve already mentioned, Starburst is a very lavish looking slot, utilising purples and golds to best present the feeling like you’re living the life of luxury out there in the farthest reaches of outer space. Since this is a NetEnt developed slot you should only expect the best, and well, the best is what you’re gonna get in Starburst. When matching symbols on these reels one will notice various animations that alter the screen in a very rewarding fashion; we wont forget the first time we witnessed our first combination that caused the screen to let out a massive sun shine effect that appeared across the screen, if anything this effect made us want to play more in order to see it again. Bets here can be placed from as little as 10p to around £100 per spin making it a very fun slot to play around in if you simply enjoy playing slots for the fun of it. This is a very laid back slot that can be played at anytime and will offer a different experience each time. 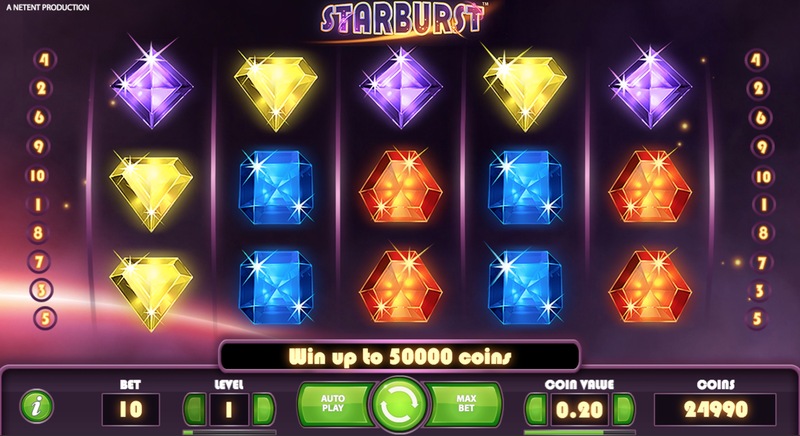 Symbols in Starburst take the shape of various jewel and diamond symbols, all of which represent something different numerically speaking, although matching more of these symbols will provide players with more depending on the initial bets placed at the beginning of each spin. On top of it’s very simple gameplay lies various bonus features that all alter gameplay in a way that makes every spin as different from the last. Keep in mind that there are no additional free games as outlined above, meaning what you see here is what you get aside from the few exceptions. EXPANDING WILDS: On-top of the simple wilds found here, one can expect these symbols to expand depending on the reels that they appear on. When matched on the middle reels will they expand, giving players multiple chances of matching these symbols in accordance with other symbols on the reels. RE-SPINNING WILDS: If one manages to match the wild symbols on reel 4 then they will be re-spun automatically, giving players a chance to come out on top with various other winning combinations and scores. JACKPOT: There is a 250 coin jackpot in Starburst that can be found when matching certain symbols on the reels. Starburst gives players the chance to take a trip starbound for what feels like the first time in an online slot. The experiences on offer here are very interesting indeed, and are also very simple in nature. Try not to be narrow-minded when it comes to playing Starburst as this will often lead you to not playing the slot, which would be a shame indeed as Starburst is one of the most popular slots going today thanks to all of the reasons stated above. Check out Starburst today! Or why not play Fluffy Favourites?